The Community Conservation Social Enterprise Development (CoCoSED) Initiative is an Initiative which seeks to provide sustainable financing to Conservation activities while providing long term economic and financial resilience to communities adjacent to Protected Areas, Biodiversity Hot-Spots and fragile landscape. Before the implementation of this Initiative in 2016, Gorillas recorded were between 25 to 35 individuals but now there are about 45 Gorillas and about 180 to 200 Chimpanzee. Also, over 1000 members of communities adjacent to the protected area have been trained on biodiversity conservation and alternative sources of livelihoods provided to raise more income to the communities as well as to the conservation of biodiversity. The Lebialem Highlands area where this protected area is found is one of the poorest areas in Cameroon. Very low levels of income (usually less than ½ US$ a day), limited land management skills, lack of credit facilities, lack of market access and lack of medical care characterize all the communities in the highlands especially those bordering the protected area and those completely lacking access routes. Their economy is essentially that of hunting, farming, gathering and fishing. Their agricultural potentials are low especially as they continue to farm on marginal lands pruned to landslides every year and their economic options are low due to lack of market access. They depend solely on the forest for their livelihoods. Thus this Initiative seeks to address these challenges by providing the local population with alternative sustainable sources of income so as to diviate their attention from the forest and to also conserve the biodiversity. And to further improve on their livelihoods. The main beneficiaries of this innovation are the most vulnerable population who leaves adjacent to the Protected Area. They include; hunters, trappers, farmers, poor resource households, women and youths. The blocks are interrelated as thus; group the various households into cooperatives alongside with cooperative enterprise development. The aim of grouping the households into cooperative is to ensure that all the household produce are being purchase and commercialize through the work of the cooperative. Also the cooperative will make savings through the Biodiversity Community Trust and microcredit will also be given to the cooperative to carry out investment activities. At this stage all the benefits (100%) will go back to the cooperative for reinvestment. To ensure continuity of the cooperative, ERuDeF through her Social Business Division (Silver Back Company Limited) will then buy all the produce from the cooperative at a price higher than what they purchase the produce so that the cooperative can make some profit. 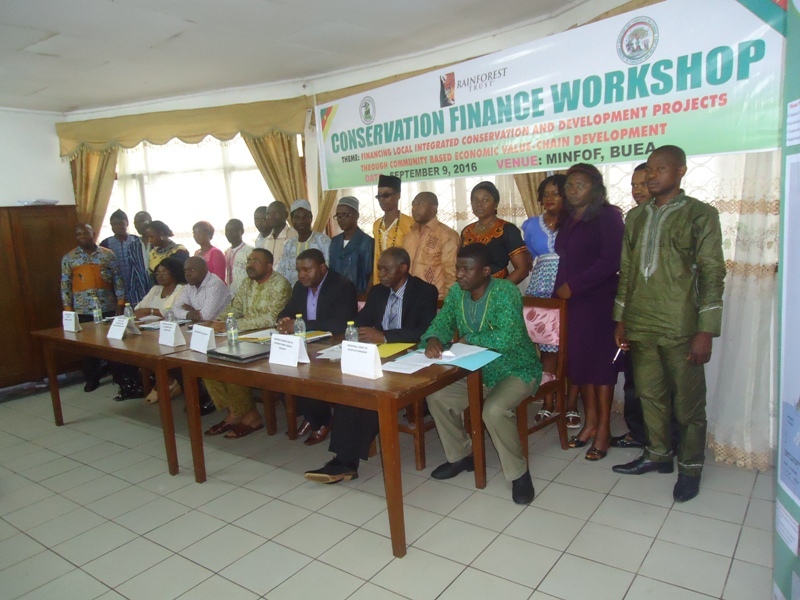 Furthermore, inorder to raise sustainable finance to carryout sustainable development and ensure biodiversity conservation, profits from local micro finance(30%) and from the social business(60%) are forwarded to the Forest Protection Fund. At this stage, the money is use in carrying out community-based conservation Initiatives such as law enforcement, anti-poaching, forest suveillance and eco-development project. Through this Initiative, there has been increase in the number of endangered species such as Chimpanzees (about 180-200), Cross-River Gorilla( between 25 to 35 in 2016 to about 45 individuals) and some key plants species. Also, the capacities of over 1000 inhabitant have been built in the management of protected area and the importance conserving the environment. Socially, Women Associations have been formed and their capacities built in alternative income generating activities. Books have been donated to most vulnorable people to facilitate their education. Support to Infrastructural development of Schools have been carried out in this protected area . Economically, over seventy youths have been employed into the varous units. Income of households have been increased (less than a dollar/day to 1 USD/day, four cottage industries have been set up , market accessibility have been provided to communities to market their produce. ERuDeF in giving support to Conservation and Development Projects in Communities adjacent to the protected Areas through her partners starts by carrying out livelihoods gap needs assessment. This is to know the socioeconomic status of the people living adjacent to the protected areas. When these statuses are being known, the next step now is Household livelihoods development. At this stage, the household are being trained on alternative income generating activities like Beekeeping, Piggery farming, etc. All these are to better their living conditions and to reduce their over dependence on the forest for a livelihood. Also, the household will be given microcredit through the Biodiversity Community Trust (BCT) to improve on their investment and at the same time the household will do savings for future investment at the BCT. Moreover, the benefits made at the level of household will go back to them through the sales of their produce. Furthermore, the household will also receive some donations like piglets from ERuDeF meanwhile after the elapse of one year, the household need to give back the piglet that was donated to him/her in the form of a pass on gift which will then be given to the next household and the process continues. When household developments have been completed, the next step is to group the various households into cooperatives alongside with cooperative enterprise development. The aim of grouping the households into cooperative is to ensure that all the household produce are being purchase and commercialize through the work of the cooperative. Also the cooperative will make savings through the BCT and microcredit will also be given to the cooperative to carry out investment activities. At this stage all the benefits (100%) will go back to the cooperative for reinvestment. To ensure continuity of the cooperative, ERuDeF through her Social Business Division will then buy all the produce from the cooperative at a price higher than what they purchase the produce so that the cooperative can make some profit. The Silver Back Company Ltd will then look for market to sell the produce she purchased from the cooperatives. At this stage, 40% of its profit will be reinvested into the company while 60% will go to the ERuDeF Endowment Fund. At this level, 30% of the Fund will go to the protected area management while the remaining 30% will go to the Forest Protection Fund (FoProF). At the level of the BCT, 30% of its annual benefit will also go to FoProF.